1. FOLLOW US on Instagram @ch_couturehouse. Entries will be accepted through 5/26/19. Multiple entries allowed (up to 10 per account). Winner will be randomly selected from all valid entries and announced the week of 5/27/19. Winner will be awarded a $100 Visa Gift Card. YOUR ACCOUNT MUST BE PUBLIC TO ENTER. If your account is private, unfortunately we can't see or count your posts as entries. Consider making your profile public for the duration of the contest if you'd like to be eligible. By entering, you are authorizing Couture House to respectively share and publish the photo and caption on our website or social media outlets for marketing purposes. Inappropriate images will be reported. This promotion is in no way sponsored, endorsed, administered by, or associated with Instagram. Contest details subject to change. Did you see us on the news?!? Thank you to Chelsey Hernandez and ABC 13 for stopping by to check out Couture House. Proud to be a Stretch Your Dollar segment. We truly love giving clients the power of choice in formal wear. Borrow or Buy? You Decide. 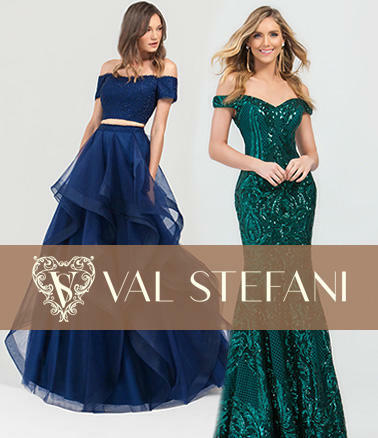 Madison James is always one of our best selling collections and we just restocked for prom shoppers. They design the most elegant, yet simple styles that flatter everyone and come in the hottest colors of the season. Come check out some of the most popular styles before they're gone.